So this week I was sitting in my office, when the church’s phone rang. I picked it up with my usual, “St. Thomas’ Church, this is Rock. How may I help you?” The response was quick and to the point. “I want to speak with the owner, please.” Perplexed, I said, “Excuse me?” Then, slowly and deliberately, as if I were slow, “I would like to speak with the owner please.” Obviously this was a business call from some Phone Bank, with no clue as to what we were. Trying not to laugh, I said “Uhh, this is a Church.” “Oh, well…” was the response, and then there was a clear click with the line closing. The funny thing was that I was trying to get hold of the Owner, too. You see I had been in the middle of my prayers when they had phoned in. We are looking at three versions of that story today. At first glance they may not seem the same, but in each instance, Jesus breaks through. The Risen Lord meets people where they are, and in their needs he loves them to where they need to be. Saul was about the LORD’s work, or so he thought. In his zeal for Orthodoxy he missed something. He had equated the Institution with the Faith. While aligned, hopefully, they are not the same. He chose to kill and terrorize these upstart followers of the Way, as it was coming to be called, an offshoot of the faith of the Temple following some leader, Jesus of Nazareth. If Saul’s stonings would not destroy the Way, the fear of them would drive the Way-people into hiding and hopefully silence. With orders from the religious council, he set off to the Jewish community in Damascus, over in Syria. There were followers of the Way over there, and he was tasked to share his religious justice to these heretics. This week the new Star Wars came out on DVD. Being the geek that I am, we have watched it already. In the Bonus Features with the movie, the actor portraying the bad guy, Kylo Ren, talked about something that reminded me of Saul on his way to Damascus. The actor said, paraphrased, “We are all the hero in our own story. We do not set out to be evil. We are good or justified in our own mind.” That was Kylo Ren, and it also was Saul. He thought he was following God. He thought he was doing the Right Thing. On the road to Damascus, Jesus broke through in the only way that he could. Saul in his zealous love for God would not listen to anyone’s arguments or see the connections from the prophecies about the Messiah. Saul would have known them backwards and forwards. We know from his writing that he was a Pharisee. He would have been steeped in Scripture from his earliest days. But he was so focused in on the letter of the Scriptures, he missed the intent and Spirit of the Scriptures. The only way for him to hear would have been from God himself. And that is what happened. He was not without faith, his deep zealotry was only misguided. What he needed was some direction. 9:3 Now as he was going along and approaching Damascus, suddenly a light from heaven flashed around him. 9:4 He fell to the ground and heard a voice saying to him, "Saul, Saul, why do you persecute me?" 9:5 He asked, "Who are you, Lord?" The reply came, "I am Jesus, whom you are persecuting. Saul, soon to be Paul, knew God when he saw him, and listened. He took days to see again, and years in Arabia to let it soak in, but listen he did when God broke through. I wish we had time today to get into Ananias and his faithfulness despite what common sense told him to do. But Jesus meets Peter where he was as well. Jesus lovingly called Peter in much the same way. I love Peter. He is so real. He acts first and thinks later. He is an all or nothing kind of guy. Remember when he refused Jesus washing his feet? “You won’t wash my feet, Jesus.” But then Jesus said if he doesn’t then Peter has no part of him, and the Peter demands Jesus wash all of him. All or nothing, that is Peter. One of the main reason I believe the Gospels are so accurate, is that no one would allow themselves to be portrayed as such morons unless it were true. The disciples led the Church in its infancy, and yet the Gospels shows them to be all too human, all too flawed, all too much like all of us. When Jesus died, Peter was left with the shame and guilt of his denials. Jesus even told him it was going to happen. And when he did it, and even then was surprised that he had done it, he broke down and wept. On Easter morning when Peter heard from the women that the tomb was empty he ran to see for himself. His mixed feelings, so desperate for hope, but so dreading the encounter. Not knowing what else to do, he went back to his old life, his old habits, his old ways. Obviously a natural leader, when he suggested that they all go fishing back in Galilee, his fellow disciples went with him. He still had conflicted feelings that day in the boat. When he figured out that Jesus was on the shore, Peter grabbed his clothes and jumped in the water to beat the boat there, so wanting to be with Jesus. But when he got to shore nothing is said about what he did and said. It does say when the boat got there, he was the one that went back out to drag in the net. Was he possibly avoiding Jesus? I think he probably was. But then Jesus instructs them to bring over some of the big fish they had just caught. And while Jesus is heading up the first Church Fish Fry, he talks with Peter in the only way he would have heard. Jesus did not confront him on his denials. He did not need to do so. Peter was beating himself up already. But Jesus set the stage in ways that were psychologically profound. That night of the denials, the charcoal fires were burning and Peter was by them warming himself, the Gospel of John tells us. We all know that unmistakable aroma of a charcoal fire. For us it is the smell of summer and of cookouts. For Peter, I am guessing, it was the smell of failure and shame and guilt. It is no mistake that the ONLY OTHER TIME that the words “charcoal fire” are used in the New Testament are when Peter ate breakfast with Jesus that morning. Psychologists have proven the strong ties between scent and memory, especially emotional memory. The other day we were out to eat and my daughter tried her grandpa’s peach cobbler. “It tastes like Christmas,” she said. Immediately I knew she was talking about the cinnamon. She had tied that taste and scent to her memories and feelings of Christmas. I smell chestnuts roasting and immediately I am on a street corner in New York next to a hot dog stand in the cold. Peter would have been swimming in the memories of that night, that dreaded night when he denied the Lord. After each confession of love, Jesus gives him something to do. Peter, remember, acts first, thinks later. He was definitely a doer. Love me? Yes! Feed my lambs. Tend my sheep. Feed my sheep. Three actions. If you love me, show me. That day Jesus gave Peter a moment of grace. Jesus was not done with him yet. I used this quote last week at the Bluegrass Mass, but it is too good not to use again. From author Frederick Buechner, “Resurrection means the worst thing is never the last thing.” Jesus showed Peter by not bringing up his denials but giving him a task to do that his worst moment was not the end of the story. Jesus had plans, and Peter was pivotal in making them happen. He met him where he was and got him to where he needed him to be. The last confrontation might seem a surprise, but it is from the Revelation text. Through John of Patmos, we see a vision of heaven. While I do not see the need to take this literally, I do believe in the Truth with a capital T of the vision. The persecuted church who were the first recipients of this text needed a reminder of who they were and what they were to be about. In today’s text, all the Elders, often seen as the 12 apostles and the 12 prophets, are around the throne with the four living creatures, portrayed on our Gospel book and often taken for the Gospel writers, with all of creatures in heaven, on the earth, and under the earth, and in the sea, and they sing out, "To the one seated on the throne and to the Lamb be blessing and honor and glory and might forever and ever!" You have heard the phrase God is in his heaven and all's right with the world. The persecuted church heard the same message that day. God is on his throne. However, what is the image of Jesus? A mighty conqueror? No. A lamb. A slain lamb at that. One that is meek and weak. One that is wounded and sore. One that is worthy of all honor and praise. This is what we look to, this is what we are given. This is a reminder that all will be okay, but also it gives us our marching orders. We follow a Jesus who rides in on a donkey, not a stallion. We follow a Jesus who washes his disciples’ feet, not one who demands his way. We follow a Jesus who loves us to death. Literally. In the vision from Revelation we are shown that the humble way of unrelenting love is at the center of all that is. The Risen Lord as the Lamb that was Slain painted for the persecuted Church a stark difference to the Emperor who conquered by fear and intimidation. It paints for us the same. Stop worrying about trying to get hold of the Owner. The Owner is trying to get through to us. Will we take the call? Jesus’s last words to Peter on that morning over breakfast speak to us today as well. We have nothing to fear. We do not need to use fear and intimidation to demand orthodoxy, like Saul. We do not need to let our worst thing keep us from following Jesus, like Peter. No matter where we are, no matter what we have done, Jesus calls us, like he did Peter that day. 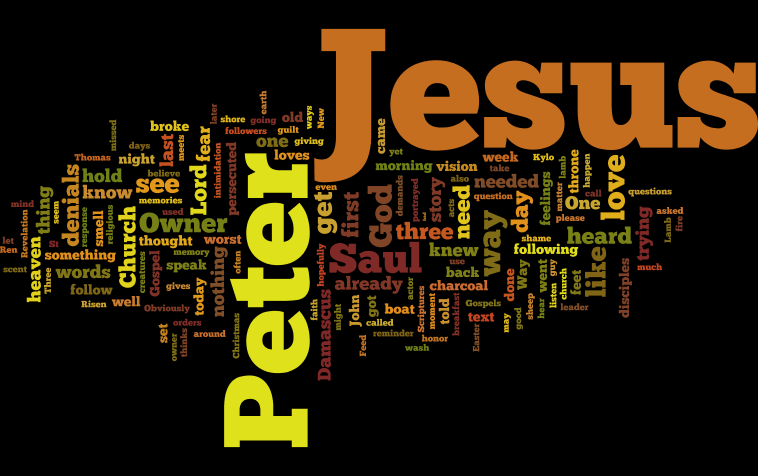 After the three questions and three commands, the story ends with Jesus giving Peter two simple words. Jesus’ final words to Peter stay with us, because they are for us, too. Jesus said, and says to us, “Follow me.” Amen.